This is my second post as a BIZ Ambassador. Clothes shopping has never been my thing. My sister however loves to shop for clothes. When I buy something, I buy it for comfort and hopefully to last. When I was younger, I hated shopping for clothes so much, I would let my family pick my clothes out. Thankfully, my sister has great fashion sense so I usually looked like I fit in at school. I thought that when I got older, I would start like to shop for clothes. That did not happen for me. I love shopping for Noah's clothes. I think there's something about changing in a dressing room in a store. I just tend to buy my clothes off the shelve and hope they fit. I wear a lot of t-shirts and pajama pants to be comfortable while working at home. I do have some nice dresses and tops that I wear when I am out doing things. Noah on the other hand has so many clothes. It seems like I am constantly buying socks. I am convinced that there's a sock monster who eats them while we sleep. In reality, Noah shoves them under his Lego Table or under the computer desk and I find them a couple weeks later. I don't know how he gets his clothes so dirty. I know he plays hard and works hard at school, it has improved but he used to come home with paint all over his clothes and dirt and stains. I like using BIZ to get the stains out. You just pre-treat the stain with BIZ and then wash normally. 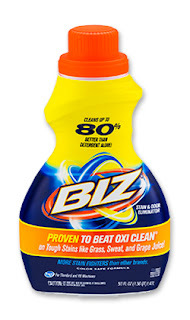 I like using BIZ as a detergent. I like the way it smells and cleans clothes. 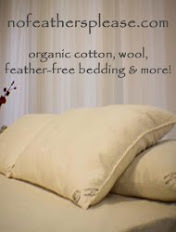 It has improved the life of our clothes by making them stain free and clean. Sometimes you can't help the inventible and your clothes end up ripping. This happens to me a lot with pajamas. It doesn't matter what the brand is. However the more expensive the pajama pants it seems like the easier they rip. It makes me sad when a pair of pajama pants rips. I have grown attached to some of them more than others. I won't throw away the ones that are really special. I recently went to the dollar store and bought a couple baskets in an effort to organize my bathroom. While I loved the price, the baskets were a little strange looking. I was going through my dresser and I found one of my favorite pajama pants that I never had the heart to throw away. I haven't worn them in years. I got an idea of covering the basket with them. They were ripped up one leg. I washed them with BIZ before I grabbed my glue gun and went to work. I think it turned out really cute. Now I have a cute basket to store all the stuff on my bathroom counter without knocking things over. This post is sponsored by BIZ. All thoughts and opinions are my own.